The Anritsu S412E LMR Master with DMR Analyzer, Option 591, is designed to test and verify the performance of DMR radio systems. The DMR Analyzer supports measurement of time-slotted DMR transmitted signals while directly connected to the transmitter (through a power attenuator) or over the air with an antenna. 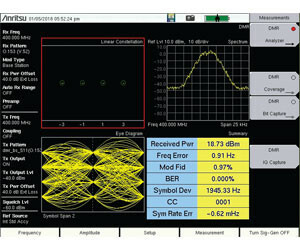 The signal analyser input has the sensitivity to measure DMR signals down to –115 dBm, allowing transmitter problems to be analysed and verified miles away. Separate demodulators are available for Base Station (BS) and Mobile Station (MS) systems. Receive test patterns include the DMR standard 1031 Hz BER pattern, the O.153 PN9 BER pattern, a proprietary voice pattern that estimates BER from audio transmissions. The built-in DMR signal generator offers over 10 DMR test patterns including the standard 1031 Hz voice-framed BER pattern and the O.153 PN9 BER pattern. The generator power level can be controlled over a 130 dB range from 0 to –130 dBm to support receiver sensitivity measurements. The 0 dBm signal level supports amplification to higher levels with an external amplifier for use as a temporary BER test transmitter for coverage assessment. The frequency of the DMR signal generator can be either locked to or controlled independently from the DMR Analyzer frequency. 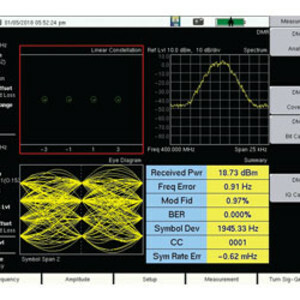 Supported RF measurements include received channel power, frequency error, channel spectrum, eye diagram, constellation, linear constellation and power profile. I am interested in Anritsu LMR Master with DMR Repeater Testing & In-building Coverage Mapping .